Please tell me the birthstone crystal choice here. 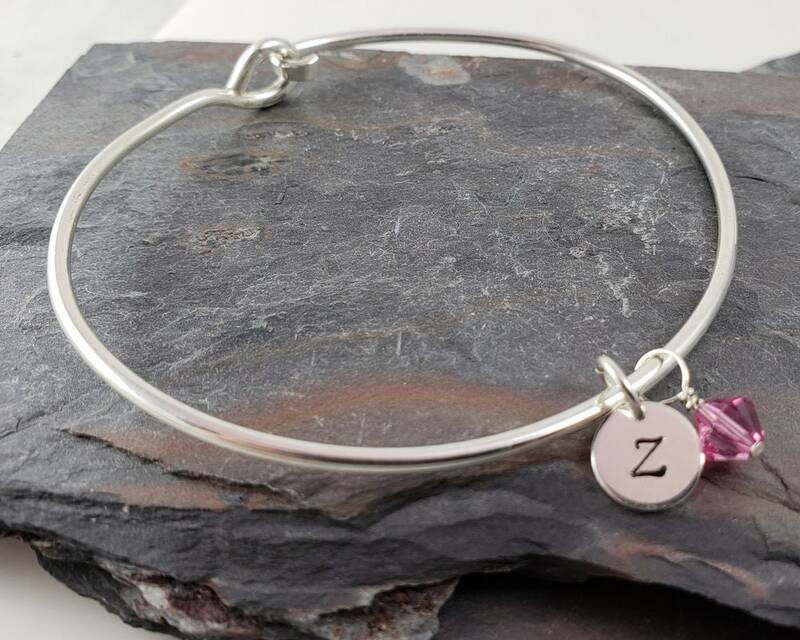 This sterling silver bangle bracelet is so easy to wear. It has an easy open clasp that makes it so convenient to add charms to your bracelet. I will include a tiny sterling silver 8.9mm initial (or number) disc and a 6mm Swarovski bicone birthstone element with your bracelet. you can easily add and remove them, or place them on a chain if you like. If you want a number instead of an initial please let me know in the "note to seller" field during checkout. You can also let me know the font you want. If you do not choose a font, elegant will be used by default. Please choose your birthstone crystal from the photo in the listing. You will need to tell me your choice in the note to seller field. If you do not tell me a choice, a pearl will be used as default. Please note this bracelet is meant to be worn as a bangle. It is not meant to be unhinged to place on the wrist or remove from the wrist. It is only meant to be unhinged to add your favorite charms. The bangle should easily fit over your wrist and be worn loosely like any other bangle. Measuring 2mm in width it is sturdy enough to wear alone, but small enough to add to other bangles as a stacker. It's easy to measure your wrist to find out what size you need by placing your thumb and little finger together and measuring the largest part of your hand with a soft tape measure. Don't hold the tape too tightly. This will be the size you need in inches. You can also go to a local jewelry store and have your hand measured for free. The clasp on this bangle has been forged around by hand and soldered shut. The hook on the other end has been forged as well for strength and filed smooth.